The slideshow above presents 3 images of an approaching shelf cloud. A shelf cloud is a low, horizontal, rolling cloud that is “attached” to the base of a parent cloud, usually a thunderstorm. It requires strong convection (updrafts and downdrafts) and warm humid air ahead of the storm. Click on the thumbnail below for a simplified graphic of the dynamics. 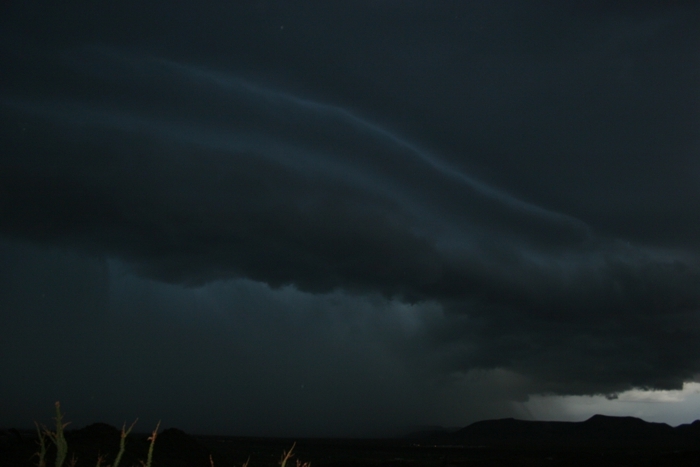 Horizontal rotation can often be seen in the leading part of the shelf cloud, while the underside often appears turbulent and wind-torn. 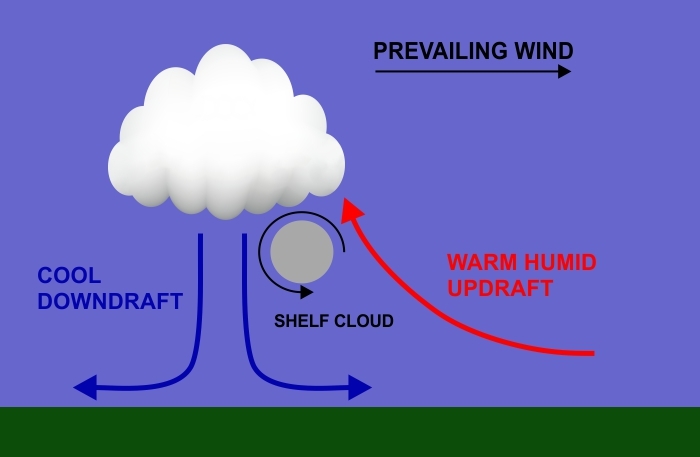 The rotation is caused by wind shear between the downdraft and updraft. Cool air from a storm cloud’s downdraft spreads out across the ground, creating a gust front. This outflow cuts under warm air being drawn into the storm’s updraft. 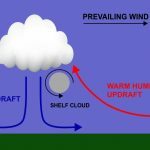 As the lower cooler air lifts the warm humid air, its water condenses, creating a cloud which often rolls from the differential winds above and below. In more violent storms, this rolling motion can become rapid enough to generate a tornado. Virtually all tornadoes first form horizontally, then tilt into their usual near-vertical orientation because of unstable updrafts. 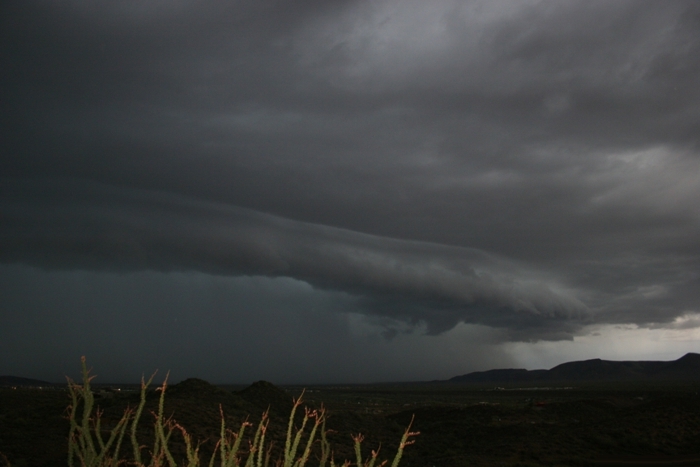 We don’t get many tornadoes in Arizona, but this shelf cloud looked really ominous as it approached. The three images in the slideshow were taken at 5 minute intervals, so you can see how quickly it was moving. There was a fair amount of lightning (not caught on camera) that would light up the shelf cloud internally like a long fluorescent tube. Quite the spectacular show. A few minutes after that third image the gust front and rain arrived, and I had to get inside and dry off my camera. The gust front is the leading edge of the downdraft surrounding the storm. It spreads out in all directions, but is strongest in the direction the storm is moving. If the desert surface is dry, and enough loose sand is available, the gust front can pick it up and create the type of sandstorm known as a haboob. That’s the Arabic word for “blasting” or “drafting.” I got a great photo of a haboob you can see in my August 29, 2011 post (scroll down for the thumbnail). The gust front from this storm was strong, with wind speeds over 15 m/s (30 mph), but the ground was damp from recent rains so most of the sand stayed put. The show was over within 30 minutes. The wind died down and calm weather returned. 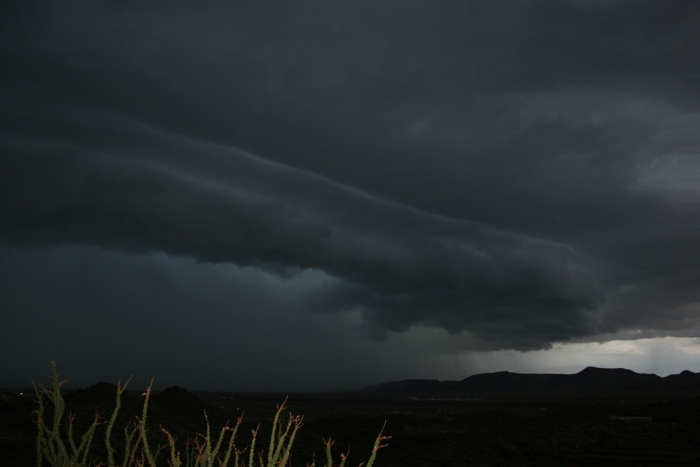 But if you ever see an approaching shelf cloud, prepare for gusty winds with rain or even hail. The three photos in the slideshow were all shot at full auto to better capture the darkening effect. I could have used different exposures to better show the cloud structure, but decided this would work best. I left my flash on to illuminate that ocotillo in the foreground and provide some color in what was otherwise a dark and gloomy scene. You can see that by the time the final photo was taken, I had to back up under the safety of the overhang on my deck.